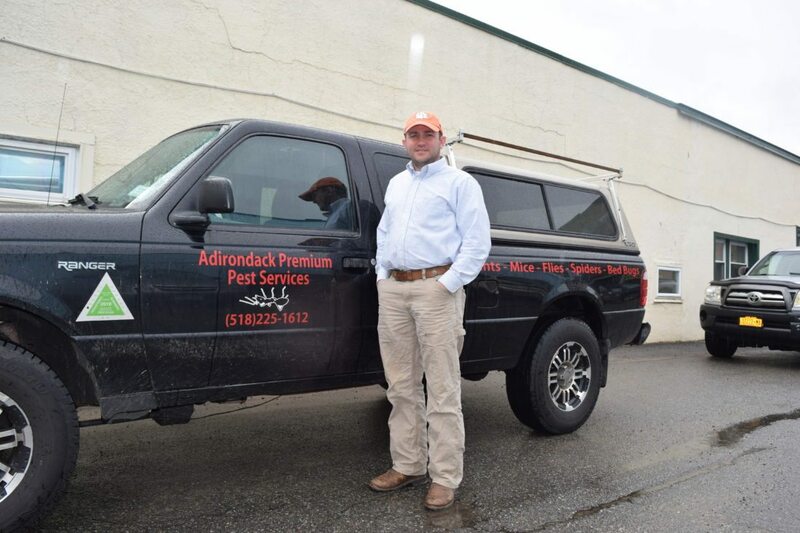 Scott Gibson, owner of Adirondack Premium Pest Services, said bedbugs aren’t the biggest problem he sees, but they can be one of the most expensive to treat. “A lot of people don’t realize how big a problem it is because it’s very hush-hush,” Gibson said. Bedbugs, tiny brown vampires that bite you when you’re asleep, aren’t social like ants. To treat ants, for instance, Gibson can lay down insecticide that the ants will carry back to the anthill on their feet. “They bring back food; they take care of their young, like us,” Gibson said. “They spread it just like we would spread a cold to other people. “Bedbugs aren’t social, so you can’t get them that way,” Gibson said. They only congregate to mate, and “mate” is using the term loosely. Male bedbugs are attracted to other bedbugs that are full of blood, regardless of gender. Their mating is characterized by entomologists as “traumatic insemination” because they basically drill through the shell of their target, which can result in less bedbugs rather than more if that one is a male. Too much information? That’s what dealing with bedbugs is all about. Bedbugs have been with humans since caveman times, but it’s a very human response that allows them to spread through our homes and businesses: shame. Gibson has treated 15 to 20 buildings in this village in the last few years. He admits he could walk through Saranac Lake and point out the buildings he’s treated for bedbugs, but he’s not going to tell on his customers: “It’s a professional confidence,” he said. Gibson, who grew up in South Carolina, said his mother remembers his grandmother pouring boiling water in the cracks of their floor to kill the bedbugs. In his work he’s using some of the same techniques, sometimes treating with steam, because high heat is one thing bedbugs can’t stand. By the time DDT was banned in 1972, bedbugs were already developing resistance to the pesticide. “We come up to the present, and now we have a new and improved bedbug, resistant to many of the pesticides we have to use,” said Gregory. Bedbugs started becoming a problem in upstate New York 15 to 20 years ago, according to Gregory. In the Adirondacks, the pests arrived with travelers. It’s no use hoping the cold will kill them, because they hide where people live and don’t go out if they don’t have to, and they can live more than a year without a meal. Scollin raised the issue with state officials 10 years ago, but they told him it’s a building and code enforcement issue. Unlike ticks and mosquitoes, bedbugs are not a disease vector. They harbor diseases, but they don’t pass them from human to human. However, the pesticides used to treat them can be dangerous for the very young, the elderly and people with compromised immune systems. “I’d like to see it addressed on a town level,” said Gibson. That’s because finding the source of bedbugs can lead to a lot of finger-pointing, he said. On one hand, there are a lot of transient residents of the community who move from place to place. It’s easy for someone to bring a bedbug — juveniles are about the size of a strawberry seed — on their shoes or clothing into a building. Tourists can bring them from — and to — hotels. Gibson said he’s treated homes worth hundreds of thousands of dollars, whose owners picked up bedbugs traveling. “It’s not just people who are very poor or people who are filthy,” Gibson said. By law, landlords are required to provide a pest-free building, “but if the landlord’s keeping it up, and doing everything they need to do and someone moves in and they bring them — it’s a slippery slope,” said Gibson. One way he’d like to see town officials get involved is by regulating the practice of leaving free furniture out on the curb. Bedbugs and other vermin can hide in pieces of furniture, even in used clothes. Gibson recommends getting professional help as soon as you suspect a problem. Don’t try to treat it on your own. As a licensed pesticide applicator, he’s required to take around a dozen continuing education units every three years, so he knows what’s working and he knows how to use it safely. Addressing the problem early is key. Catch the bug on a piece of clear tape and fold the tape over, so you have a specimen to show. “Try not to squish it too much,” Gibson said. The experts say getting rid of clutter, especially clutter around the bed, is part of treatment. Pull the bed away from the wall, and don’t let the bedclothes touch the floor. Bedbugs like to hide in box springs, mattresses and headboards, as well as any other piece of furniture frequented by their favorite food. Old-fashioned house cleaning, with lots of warm water and soap, and daily vacuuming, will keep your house from being reinfested after treatment. Seal cracks where bedbugs could get in, and be careful not to bring them in yourself. “You may have to take things a little more slowly, and look at the spot you sit on if you’re in public, before you sit there,” Gregory said. And if none of that works, call somebody’s grandmother — the older, the better. She’ll know what to do.